Avan Jogia first caught our eye as the dreamy, mysterious Beck Oliver on Victorious. Now he's taking on a hilarious new role in Rags, Nickelodeon's original musical movie, starring Max Schneider and Keke Palmer! We caught up with Avan and he told us all about his latest projects and even spilled some behind-the-scenes secrets from the Rags set. J-14: Do you have anything in common with Finn, your character in Rags? Avan Jogia: He's definitely a performer and I am as well. He's incredibly into himself, and only interested his career and furthering himself. But I don't think I have any of those qualities! When they said they wanted me to [play Finn], they didn't have anything written down as to what Finn would be like. I thought it would be fun to do something like Russell Brand, and we took that and ran with it! It was loads of fun to play that kind of character. J-14: What was it like filming Rags in your hometown of Vancouver, Canada? Avan: It was nice to film at home, to go back to how I started with acting. They'd put me up in a hotel in my hometown, which I thought was really funny. The hockey series between the Boston Bruins and the Vancouver Canucks was going on, so we went to all the spots to watch the games. I'm take my hockey very seriously! 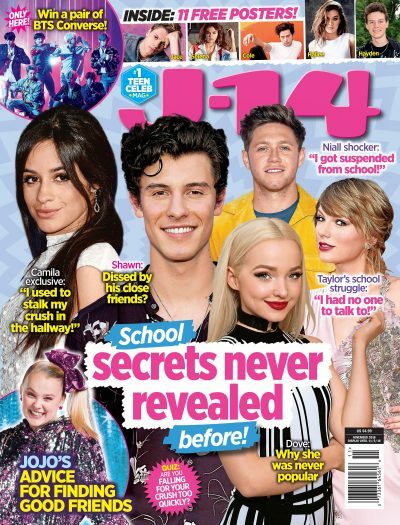 J-14: Sounds like quite a trip! Okay, we have to ask: What's coming up next on Victorious? Avan: We just did Tori Goes Platinum, and we have a bunch of cool episodes in the mix. There's going to be some interesting changes for the audience to see, and different connections between characters. J-14: You play very charismatic characters on Victorious and now on Rags. Are you that confident with girls in real life or do you get nervous sometimes too? Avan: I think that when I really like somebody, I do get nervous. J-14: Rags is a very unique spin on the classic Cinderella fairytale. So, what's your favorite version of Cinderella? Avan: I mean, there's been a thousand of them. But one that I really grew up with? Probably Cinderella, the Disney version.